Lately I received a couple of CDs promoted in Europe by Mascot Records that gave me a serious headache. The likes of Michael Schenker, Jake E. Lee and Leslie West, all three of them legends in their own ways, decided nearly simultaneously to release albums full of old blues standards, delivered in the least possible way of motivation, urging me to pass the albums on to the blues radio show on Radio ARA before I even wrote a review because they would have been devastating. Now I get this CD from a guitar wizard from Israel. How I normally hate these ego instrumental albums, and when the rhythm section is borrowed from the band from the David Letterman Show, I wanted to expect the worst. But I was disappointed. 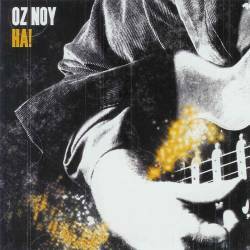 Oz Noy is one of the very rare people who achieve the nearly impossible: make an entertaining all-instrumental guitar album that is even running for over an hour. What makes Ha! such a great album is first of all the vast stylistic range present. The opener Chillin' is purest jazz rock, and the bluesy Sit Tight shows that Oz Noy is able to encompass many genres and even a sense of humour into his compositions. It's that light-headedness which sets him apart from the more serious sounding competition. And when Guitar One Magazine claimed Oz Noy to be "Jeff Beck meeting John Scofield in James Brown's band", you get the picture as clearly as possible. Noy's clear electric guitar sound is backed by a solid rhythm section, and he's at home as well with jazz as with blues, with the occasional funk element to show that he can cross any border. With jazz rock icon Mike Stern adding guitar on Downside Up, you will know instantly who will be interested in this album. It's not really rock, even hardly at all, but comes with some of the craziest ideas instrumental music has seen in a decade. Steve Vai? Joe Satriani? Here comes Oz Noy, a possible new master of fusion. Very highly recommendable!